We will start out by cutting a rail. As described in the previous article we will use a rail chisel and a sledge hammer and of course safety goggles. A rail is made up of three parts, the base, the part that rests on the ties, the web, the vertical part between the base and the ball, and the ball, the part the wheels run on. After the length of the rail is determined the cut line is marked by chalk or something to make a mark on the rail. The rail must be turned during the cutting process. This could be accomplished by using the top end of two track wrenches inserted in the bolt holes. It can be unsafe if not done correctly. There was a tool I forgot to mention. It is called a rail wrench. This wrench fits on the edge of the base or on the ball. When you stop lifting on the rail with this wrench it will release from the rail making it a safe move. You can start any place on the bottom of the base or the web of the rail. We will start on the bottom of the base. Using the rail wrench we turn the bottom of the rail up. Hitting the chisel with the sledge hammer, the chisel man moves the chisel across the base. After making a trip across and back the rail is rolled on its side and the cut line followed from the base edge to the web, up the web to the underside and the edge of the ball. The rail is rolled over and the cut repeated on the other side. No cut is made on top of the ball of the rail. If a cut is made on the top of the ball it is a possibility you could chip a piece of steel from the ball. After the chisel work is finished there are two ways to break the rail. One way is to lay the waste end on a tie and hit the waste end at the cut line with a sledge and snap break the rail. The other way is to have several men straddle the rail and pick it up and on the count of three, drop the rail on the tie and it would break at the cut line. Placing the rail in position, bolts are placed through the Joint Bars and the holes in the rail and the nuts are hand tightened. On the end of the rail where the cut was made they hooked the two man hand drill in position with the drill bit in one of the holes in the bars, the two men started cranking. There was a device on the drill that automatically advanced the drill bit into the rail. After drilling the three holes the bolts are installed, the rail is spiked to the ties and the job is finished. Raising track comes in different flavors. One is raising joints and low places and the other is resurfacing. Resurfacing usually is the complete rebuilding of a piece of track from a few hundred feet to many miles. The method used to tamp ties when raising joints varies with the type of ballast in use. When raising a low joint you sight along the inside of the ball to determine which end of the joint to place the jack. When the location of the jack is found and the jack placed under the rail the joint is raised. If the ballast is good you raise the joint about 1/2 inch above level and the three joint ties are tamped. The jack is removed and a shoulder tie on each side of the joint ties is tamped and maybe one other tie each side if necessary. Stone would be the same method except a stone pick is used to drive the stone under the ties. 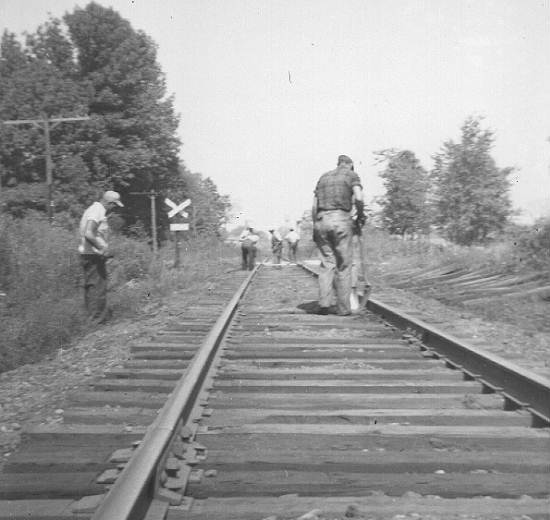 In 1947 on the Michigan Division, they reballasted some of the track with gravel. In 1948, with all of the cinders from the steam engines at the different terminals, the powers to be thought the Michigan Division would be a good place for them. That's when we became known as the cinder line. When raising a low place using cinders, the method was a little different. You could never tamp cinders tight because the end of the shovel would grind them to dust. When you raised a low joint you would raise about 2 inches above level and do what we called fanning the cinders. What you were doing was filling the space below the tie without tamping. That is why you raised the joint so high. After filling the gap you dropped jack, (that means you could set a position on the jack and drop the stem of the jack without resistance.) The joint was a little high but after a train ran over it, it was just right. When resurfacing, this included straightening and replacing ties, surfacing and lining the track. Raising and surfacing required the following in tools, 6 tall track jacks, spot board, sight block and peep sight. We already have discussed the track jack. The spot board was about 12 inches wide by 8 foot long painted white with a black 2 inch stripe down the middle of the board for its length. This board was mounted on two stands, the gauge of the track and was adjustable up and down. Next is the sight block. The sight block was a piece of wood 2 by 6 inches by about 10 inches high, with a notch 1 and 1/2 inches deep and 3 and 1/2 inches wide, letting the sight block sit on the ball of the rail. The sight block was used to zero the spot board. The peep sight was 1 inch wide with a 90 degree angle and about 10 inches high. At the top a 1 inch circle with a 1/16th inch hole in the center. To make this all work the man raising the track will sight along the rail and find the high spot about 100 feet ahead. The spot board will be placed at this point and adjusted to give the proper inches of raise. Back at the location where the surfacing is to take place, the jack men have placed the 6 jacks, 3 on each side. We start at a joint on the east rail, the line side. The sight block is placed at the joint, the man doing the raising of the track goes twenty feet away from the sight block and sights through the peep sight. The line side jack man starts raising, bringing the sight block up. This works like sighting a rifle, the sighting block being the front sight and the spot board the target. When the top of the block comes up to the top of the black line on the spot board, the raiser tells the jack man to stop. Meanwhile the jack man on the gauge side brings his side up to level by using the track level. This is repeated at the other two jacks and then three ties are tamped at every jack position. This done, the process is repeated working on down the track. 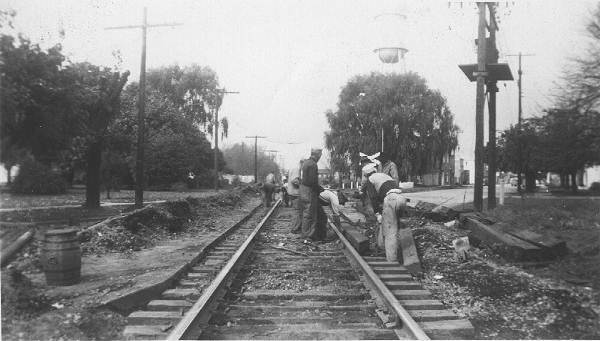 Two other tamping crews are tamping the intermediate ties between the jack stations and two other men are tamping inside the rail. Between the jack men and the tamping crew was a crew of 5 or 6 men replacing ties. At the end of the day the track is lined and the track dressed, (ballast is thrown in the middle of the track and at the end of ties.) We did have some power tools, a bolt machine for removing and replacing nuts on bars, weed mower and a few powered hack saws for cutting rail. How would you determine the degree of a curve without blueprints? You take a length of cord 62 feet long and place it point to point on the high rail, find the center of the cord and measure from rail to cord. Distance in inches equals degree of curve. In my three years as a section hand, any frog or switch point work was replacement. My father and I were talking one day and I asked him this question. If we were going to install a switch to a new industry, how would I know the distance to place the frog from the switch points determined by the number of the frog being installed? Dad explained that by math you could figure this distance and it would work perfectly. "But how do you know what this formula is and is it complicated?" I asked. His answer was, " I don't know about using the formula. I do it the easy way and use the book the railroad has that gives all of that information." The point being that the railroad did have information available to cover everything. In the following photos, the bars in the pictures are called angle bars. The bars were called toeless because they did not have the angle at the bottom. The motor car is pulling the weed mower. Click on the thumnail to see the full photo. 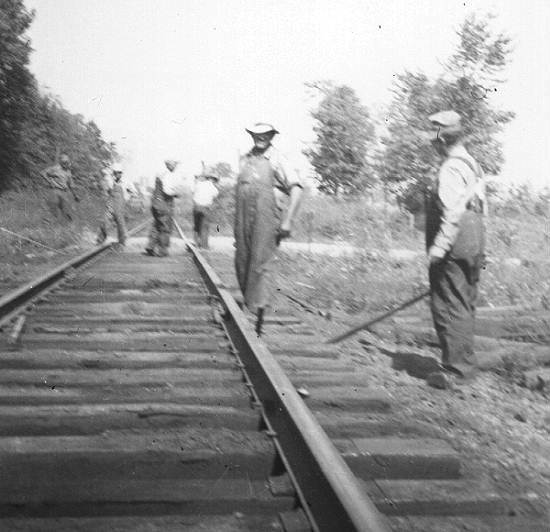 Modern track machinery was starting and in a few short years, track repair was completely mechanized. 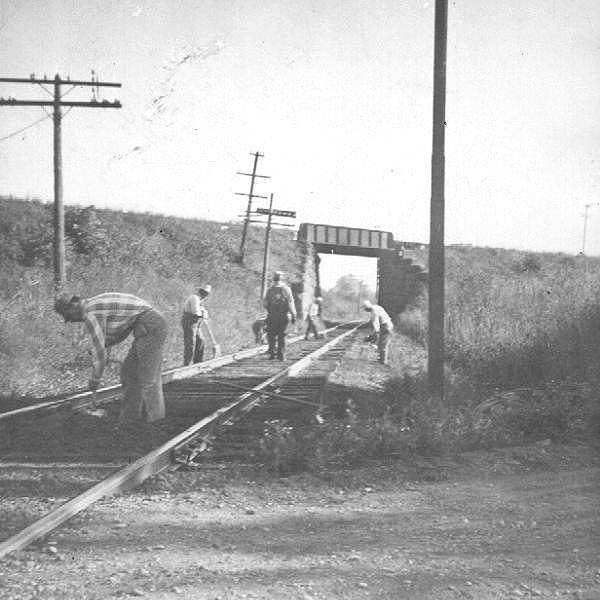 a) Weed Mowing Team at Shirley Indiana north of the depot, 1948.
b) Main Street crossing replacement at Shirley Indiana, 1953. Barrel at left is water barrel. d) One mile south of Shirley Indiana with angle bar in forground, 1952.
e) Big Four at Knightstown passing under the double-track PRR Main, 1952.
f) Same but with pole for the Tell-Tale at right.